We've listed the PSI Boxes that we have in stock below. Due to the difficulty in pre-calculating appropriate shipping, If you'd like to order you'll need to call or email us. We can then calculate the appropriate shipping. We can either get credit card information from you or you can request a Paypal invoice. If you have called us with your credit credit card information you can put your order in on-line and then put what boxes you would like in your comment section and we will add to your order and bill your card appropriately. Attractive Black Leatherette 2 Pen Binder makes a great alternative to a box. You can actually carry this around easily to protect your treasured pens. Case is 2.5 x 6.5" and zips on three sides. I'm showing with a Cigar and Monet Pen for sizing. If you turn your Cigar pen very thick it might not fit into the sleeve. NOTE: We can fit several of these into a Flat Rate Envelope. 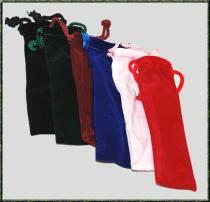 If you order a large quantity or order along with several other items there may be addt'l shipping due. Instead of adding a surcharge up-front, we'll contact you if add'tl shipping is due. Black Leatherette exterior and fold over inner flap. 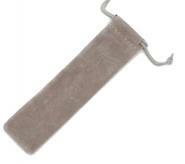 Improved smooth lining which will not scratch or discolor your pens. 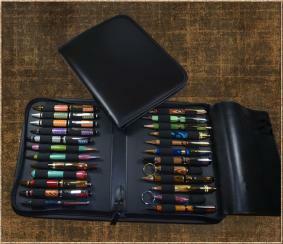 Can accommodate large pens on both sides and close without looking overfull or tight! Note:There will be a shipping surcharge on this to cover a larger shipping package. we may need to ship by weight or in a Medium Flat Rate Box. we will refund the shipping without you even having to ask! 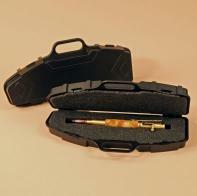 2 Pen foam insert fits in the Rifle Case Pen Box.